In the very heart of the Dizier Hamlet, the gîte called "lou bouissas" 100 meters square, can house 6 people. 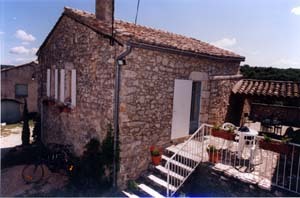 A short stone flight of steps leads to a square 35 meter terrace, partly sheltered by a roof covered with old tiles, overlooking the Lussan plain in the distance. The traditional large all purpose room, at once dining and living-room with kitchen , makes for an atmosphere of calm and harmony. The kitchen equipment includes refrigerator, washing-machine, cooker with oven and hood. Next to it are a separate toilet and a shower-room with a shower and two washstands. There are three bedrooms : the one on the ground floor, with a vaulted ceiling and a double bed; the two others on the first floor provide four single single beds.This gîte has electric heating and a woodburning stove fitted into a rustic fire-place. Wifi included.